What the IIIHS did was purchase brand new trailers and conduct tests of the eight largest manufacturers’ products. Being the IIHS, it did not simply do one type of test either. It conducted three types of rear impact crashes. The car was run into the trailer full on, with 50 percent of the car hitting the back of the trailer, and the worst one of all in terms of testing, the 30 percent overlap. All the tests were conducted with 2010 Chevy Malibu sedans. That vehicle was chosen because it was a good performer in front crash tests, is typical of the design in the segment, which is the largest car segment, and the Institute does not say so, but it is also available at low cost relative to its competitors. 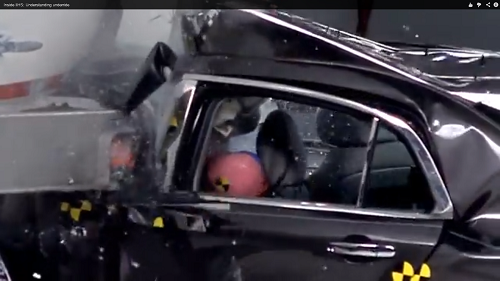 What the IIHS found is that there are a variety of designs for trailer rear impact protection. All meet government regulations (which are outdated and insufficient, go figure). However, some designs worked dramatically better than others. The manufacturers were receptive to the testing. The IIHS hopes that based on the testing all the manufacturers will adopt the best current designs.